1. Slow internet is worse than no internet. 2. I would never have been able to survive 4 months living in a country with the euro or the pound. Thank the heavens for the exchange of 1 US dollar- 18 Czech Korunas. 4. Nothing in Europe is free. 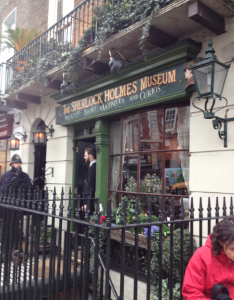 So, if you see a pamphlet on a desk at the Sherlock Holmes Museum, DO NOT pick it up and walk out assuming it’s for the taking. It’s not. My trip to London was entirely a nerd moment. This was the icing on the cake (and apparently the beginning of my kleptomania). 5. British food? Not that bad. 6. It’s not necessary to buy 2 masks for Carnivale in Venice. Also, don’t buy a full- faced one. Your roommates will NEVER, EVER let you forget it because according to them, it’s so creepy that it’s hysterical. 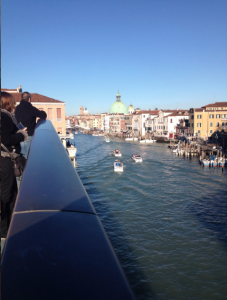 Venice is one of the most beautiful and unique cities in Europe. With no cars are large streets, canals are a main source of transportation. 7. Going off of #6, don’t buy the first of whatever you see. Odds are, the touristy shop 15 meters ahead will have the exact same thing, possibly cheaper. 8. ALWAYS ALWAYS ALWAYS have the proper transportation pass in whatever country or city you are in (Looking at you, Berlin). If you don’t, you will be fined and then it’s really awkward and embarrassing as the ticket police (not the technical term but close enough) herd you to the ticket booth and then proceed to bleed you dry (Yes, their just doing their job but it’s hard not to fantasize about them getting a really bad paper cut from your writing ticket). 9. Universal adapter= new best friend. 10. There’s a term for throwing people out of a window for political reasons, defenestration. Apparently, this has occurred enough times in history to warrant it’s own word. 11. Prague had 2 major defenestrations, the 2nd of which those that were expelled from the window survived by falling into a… well, think about the sanitary conditions of a city in the 17th century and you can probably imagine into what they landed (I think I learn more about history in my Art and Architecture class than my Modern History course). The physical injuries they sustained eventually healed but the bruises to their ego and dignity I’m sure followed them forever. This event was also a precursor to the 30 Years’ War. 12. Walking up all the way up Petrin Hill may seem like a good idea at the bottom but by the time you get halfway up, you begin to realize how incredibly out of shape you are and start convincing yourself the line for the funicular really wasn’t that bad. But the view of Prague from the top is breathtaking. Especially if you’re my roommate and are afraid of heights. 13. Going off the beaten path is the best way to stumble onto the hidden treasures you didn’t know city had to offer. Such as an orchard dedicated to a British man, Sir Nicolas Winton, who saved nearly 700 Czechoslovakian Jewish children from the Nazis. My roommates and I might never have found that if we hadn’t gone a less direct route down Petrin Hill (and by less direct I mean totally out of the way). 14. It’s impossible walk by a trdlo (or trdelník) stand in Old Town Square and not purchase a delicious, cylindrical pastry. I’ve stopped trying to convince myself that I don’t want one. I do. I always do. 15. Tea fixes everything and cheese ramen is the greatest broke, college student meal known to man. 16. No matter how long I live in Prague or how often I wander around, I will never understand how the street system works. Ever. Whoever said Prague isn’t a hard city to navigate is a liar. Apparently Wenceslas Square is a lot closer to my apartment than I originally thought. As in, it’s almost right down the street. 17. It’s not possible to find a new store, landmark, restaurant in any city in Europe without getting lost. Looks easy on the map? We’ll still end up wandering up and down the same street for 15 minutes before giving up and asking people for directions. Usually this process is repeated 2-3 times before we find what we’re looking for (Also, I’ve learned that putting me in charge of directions is a terrible idea). 18. Talking about dragons is a great way to relieve tension and make new friends. 19. Churches in Europe are some of the most beautiful pieces of architecture I have ever seen. From St. Paul’s Cathedral in London to the church of Saint Nicholas in Prague and the Berlin Cathedral, I am ceaselessly awed by their beauty and flawlessness and astounded by the idea that humans have the ability to create such magnificent structures. 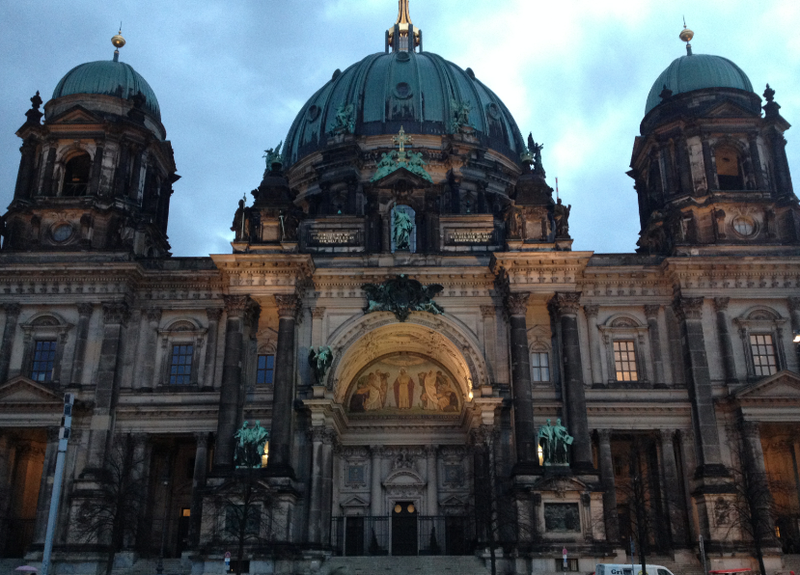 One of the most beautiful cathedrals I have every seen, the Berliner Dom, isn’t a cathedral in the technical sense. We walked inside during a service and the experience was hauntingly beautiful. 20. One semester in Europe is not going to be enough. There are too many amazing places to see and things to do that it’s not possible to pack it all into 4 months. The places I have been so far (Venice, Berlin, and London) are just the beginning of what I hope to be a lifetime of European exploration.